Make your own hazelnut praline and use it to decorate your cakes and desserts. Yesterday was not a good day in the kitchen. I had in mind a fabulous chocolate and ricotta tart adorned with golden, crunchy praline but sadly it didn’t quite turn out as I planned. My ‘lovely’ homemade tart neither tasted good, nor looked good so for me it’s back to the drawing board on that one. The only successful element of the dish was the hazelnut praline so here is an abbreviated post on how to make the praline. You can of course make praline with any nut, even salted nuts. If your nuts still have the skin on then they should be removed first. Although this process doesn’t take very long it can be a bit messy. My advice is to always buy skinned nuts if you can. The next stage is roasting the nuts. Should you, shouldn’t you? Again – this is a quick process so I would say yes. I believe the nuts taste better for having been roasted and the whole process only adds an additional 10 minutes. The next stage is the caramel. All I can say is have everything ready before you start. If you focus only on the caramel, you should come out with a gorgeous batch of liquid gold. If not – try again. It’s worth it! You can use praline in so many ways. Thin shards of praline can look beautiful on a cake or dessert. The only downside to the shards is that they don’t keep well. Unfortunately, caramel does not like moisture so it soon becomes sticky if left out for too long. Personally, I like to blitz the shards in a food processor. I then use the mixture to sprinkle on cakes, ice cream or desserts. You can also make praline paste. All you have to do is carry on with the blitzing process until the oil from the nuts starts to separate out. At this point you can add an extra tablespoon of nut or vegetable oil to the mixture and carry on blitzing until you have a thick paste. If you then add some melted chocolate you will end up with your own homemade Nutella. Preheat oven to 180°C (350° F). Lay nuts out on a baking tray and have another baking tray ready for when they come out the oven. Remove tray and move nuts around. (This will avoid hot spots). Place back in the oven for another 3 minutes. Check again - the nuts should have darkened slightly and smell 'nutty'. If you think they can take another couple of minutes without burning then do so but watch carefully. Remove from oven and transfer to the cool baking sheet. If your nuts still had the skin on then now is the time to remove them. Place the nuts in a plastic bag and roll your hand over the bag vigorously until the skins peel off. Place the cleaned and roasted nuts in a bowl next to the stove top. Line a baking tray with baking parchment and leave next to the stove top. Place the sugar and water in a pan. Stir until all the sugar is coated with the water. Turn the heat on to medium and stir until the sugar melts. Do not let the mixture come to the boil before the sugar has melted. Once the sugar has melted, leave the mixture to bubble away on it's own. Every now and again swirl the pot to redistribute the mixture. If you stir with a spoon the mixture will crystallise and be ruined. Eventually the mixture will start to colour. As soon as it reaches a golden caramel colour, remove from the heat and tip the nuts in. (Mine takes about 6 minutes to reach this stage). Working quickly, pour the mixture out on to your baking tray and spread out thinly using a wooden spoon. Break into shards using a rolling pin and use as is or blitz into smaller pieces using a food processor. Do not be tempted to touch the caramel with your fingers - it is HOT, HOT, HOT. If you end up with a pot of hard caramel just place some clean water into the pot and place back on the stove top and heat until the caramel melts. It should then be easy to clean. This entry was posted in Sweet Treats on January 17, 2014 by Angela Darroch. Normally I do my blogging on a Thursday or Friday when I’m at home by myself. Not so this month as both kids are at home on holiday. They are both quite good at entertaining themselves but nevertheless it is still just a bit more hectic than usual. I had a small window of opportunity this morning before I had to take the kids to swimming lessons and thought I would quickly rustle up these delicious little treats of avocado and chocolate truffles. All went to plan – kids playing contentedly outside while I played with melted chocolate and dusty cocoa powder inside. That was until the kids popped their heads indoors and spied the bowls of melted chocolate. By this time I was taking my photographs and was quite engrossed in what I was doing and gave a few vague nods when asked if they could lick the bowls. Kids quiet – I carried on with my photos. Most of my photos are taken next to an open door in the dining room and what I hadn’t realised was how windy it was today. Dusty cocoa powder sprinkled over a board with a gust of wind equals dusty cocoa powder all over cream floor tiles. By this time I’m starting to watch the clock so no time to clean up. Another dusting of cocoa powder is added to my board and off we go. Kids run outside – barefoot – through the cocoa powder. Next time I looked at the clock we had exactly 10 minutes to get ready. The kids were called in from the garden only for me to discover they were covered in chocolate and cocoa powder. A quick wipe over, toilet check and we were out the door in 10 minutes. I patted myself on the back for arriving on time, got the kids changed, another toilet check and made our way out to the pool past the wash hand basin with the mirror placed conveniently above it. What! What did I just see? I stepped back to take another look in the mirror and was horrified to find that I had a generous helping of cocoa powder on my face and through my hair. “Why didn’t you tell me?” I shrieked at the kids. “Well, you always look like that” was the response. There is not much you can say to that. I found myself a little corner and hoped nobody would notice as I sat and picked and wiped away chocolate from head to foot. Reminiscent of watching a chimp in a zoo, I’m sure. I first came across the idea of combining chocolate and avocado from one of my favourite blogs, Strands of My Life. I have adapted Suzanne’s cupcake topping slightly by adding the melted chocolate to make a lovely rich truffle mixture which is much healthier that the traditional full cream version. The only downside to using avocado is that the mixture doesn’t keep for very long – a couple of days at the most. Oh well – I’d better eat up. Melt half (75g) of the chocolate in a microwave or over a pan of boiling water. Remove the flesh from the avocado and place in a small food processor. Place in a shallow dish and refrigerate for 20 minutes or until the mixture is firm enough to handle. Just before removing the mixture from the fridge, melt the remaining chocolate as before. Using a teaspoon take enough mixture and roll between your hands to form a ball. You might find it easier to dust your hands with some additional cocoa powder to stop the mixture sticking to your hands. Dip in the melted chocolate and place on a baking tray which has been lined with baking paper. 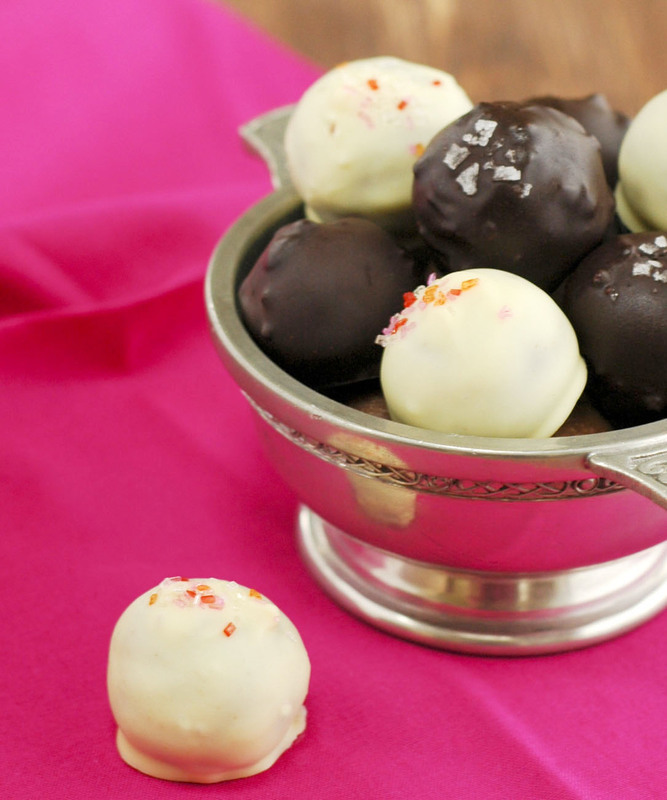 Decorate with sea salt flakes, chilli or drizzle with white chocolate. 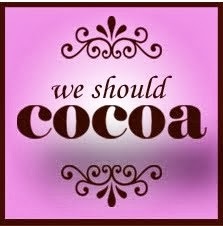 This is my entry for this month’s We Should Cocoa which is run by Chocolate Log Blog and Chocolate Teapot. 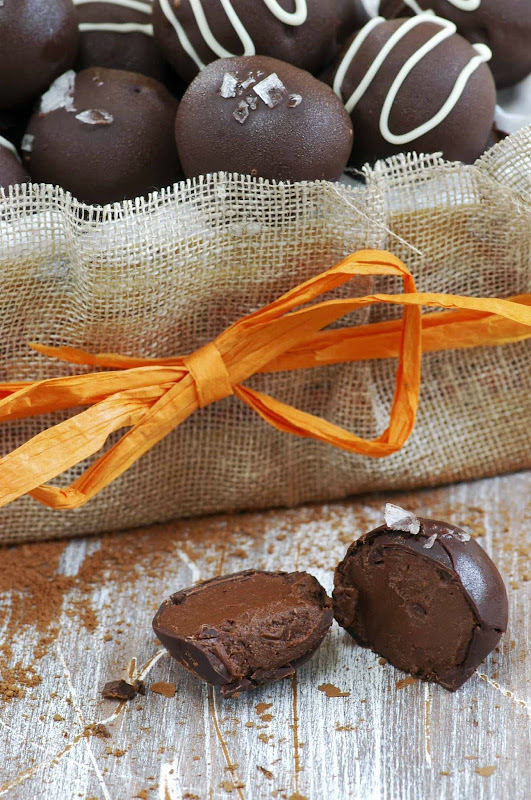 This month Elizabeth from Elizabeth’s Kitchen Diary has challenged us to make small chocolates or truffles. This entry was posted in Sweet Treats on August 14, 2013 by Angela Darroch. I have lived in the UK for 14 years now and every year I am in awe of the generosity of the people who live on this island when it comes to giving charity for projects both at home and abroad. Comic Relief is a major charity based in the UK which strives to create a just world free from poverty and has raised a staggering £800 million since its inception in 1985. I was brought up in Africa and can honestly say that we were never encouraged as children to think about giving for charity. Quite sad when you think that Africa is on the receiving end of so much charity raised in other countries. On the contrary, children in this country are made aware of donating to charity from their early nursery year’s right through their school lives. Part of the Comic Relief campaign is Red Nose Day which falls on 15th March. The idea is simple – everyone has a laugh whilst raising money to help change countless lives across the UK and Africa. The children are allowed to dress up tomorrow and have been asked to make some cakes for the cake sale. We decided to make some truffles and decorate them with funny faces and a big red nose. The kids had lots of messy fun and I did a lot of cleaning up. 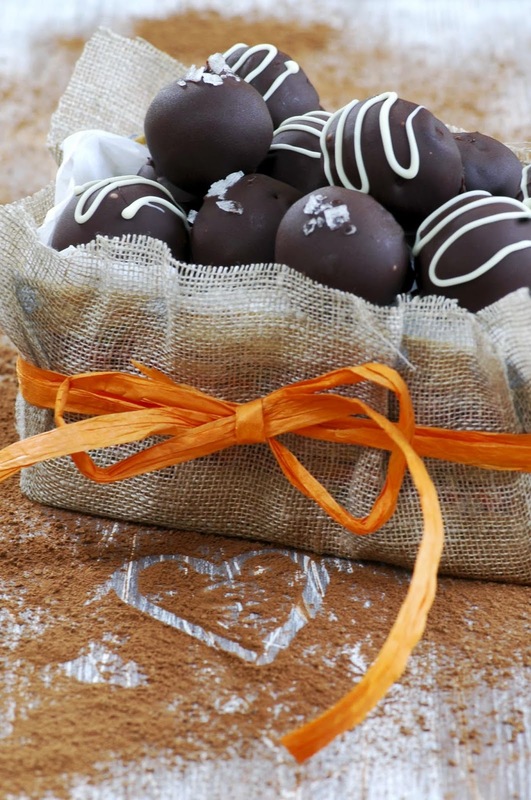 To make these Red Nose Day cake pops for the school cake sale we used this recipe for chocolate truffle balls. I found a pack of sticks and cellophane wrappers at Hobbycraft. The eyes are sugar balls which I had bought previously from my local supermarket, the noses are smarties and the mouths and pupils were done by using small tubes of readymade icing. And here they are all packaged up and ready for the cake sale. This entry was posted in Sweet Treats on March 14, 2013 by Angela Darroch. Most of my cooking and baking is done out of necessity. 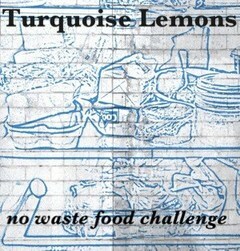 The usual healthy mid-week meals, the occasional school bake and the odd treat thrown in here and there. What I have allowed myself is one day a week to ‘play’ in the kitchen. To cook something that doesn’t necessarily fall into any of the above categories but to try something new because I will learn from it or because something just simply catches my eye. 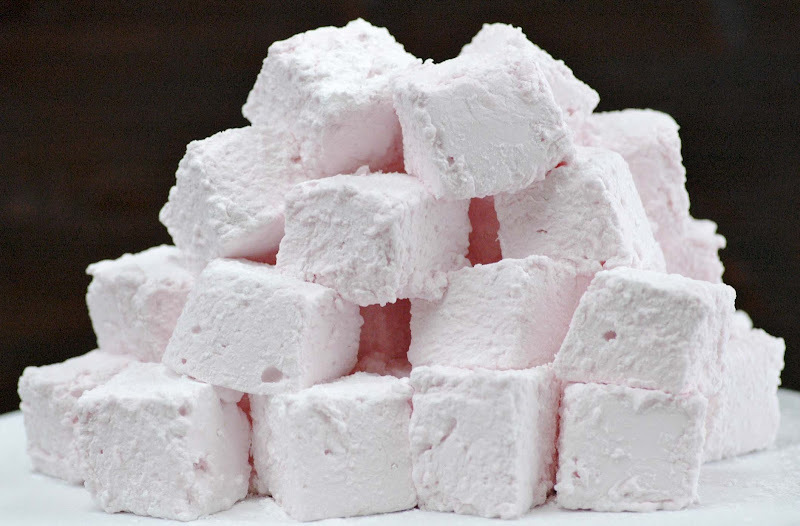 One such recipe is this one for marshmallows. They just looked so pretty that I couldn’t resist. Elizabeth over at Elizabeth’s Kitchen has challenged us to blog about recipes using up eggs. I wanted to try something a bit different to the obvious Pavlova and my egg white chocolate mousse was styled very much for Valentine’s Day so I didn’t want to enter that. Low and behold I discovered marshmallows can be made using egg whites. I am very diligent when it comes to freezing my egg whites in ice cube trays and have many a bag of them in my freezer but have never actually used any for cooking. What a good excuse to try them out. I measured everything out and was all set to go but my egg whites were frozen and I didn’t have the patience to wait for them to defrost. I thought a quick 30 seconds in the microwave would sort them out but ended up with cooked eggs. Another two egg whites came out the freezer and this time I placed them in a dish over some boiling water and within a couple of minutes they had defrosted. Lesson learnt – do not defrost egg whites in the microwave!! The sugar syrup was as hair raising as usual when you have small kids running around the kitchen. I used a sugar thermometer for the first time and would definitely recommend buying one as it takes all the guesswork out of boiling sugar. I also have a stand mixer which makes the process much easier as you can leave the egg whites to whisk away while you keep an eye on the sugar syrup. The whole process was fun but extremely messy and the outcome was delicious. They are pretty, soft and fluffy and much nicer than the shop bought ones but the unbelievable amount of sugar involved would probably put me off making them again. Well maybe just one more time …. Oh, and the frozen egg whites whisked beautifully. Sift the icing sugar and cornflour into a bowl. Lightly oil a 22cm x 22cm cake tin and dust completely with the icing sugar mixture. Reserve any left over for dusting the finished marshmallows. Place the granulated sugar and 250ml water in a heavy based pan and heat gently until all the sugar has dissolved. Turn the heat up and fast boil until you reach a temperature of 260° F or hard ball stage. Take the sugar syrup off the heat and add the dissolved gelatine mixture and stir until well combined. The mixture will froth up initially but with continued stirring will settle down again. Add the sugar syrup mixture to your beaten egg whites taking care as the syrup is extremely hot. Continue to beat the egg whites, adding your food colouring bit by bit, until the mixture becomes thick and fluffy but is still pourable. Pour into your prepared tin and leave to set for a couple of hours in a cool place (not the fridge). I found the easiest way to cut into pieces was to use kitchen scissors while still in the tin. Each piece should then pull out easily. Dust completely with the icing sugar mixture. This entry was posted in Sweet Treats on March 8, 2013 by Angela Darroch. Aaaah – peace and quiet. Today is the first day since just before Christmas that the kids have really been able to venture outdoors. My poor hubby has taken them off to the park to try and wear them out – he never succeeds but I’m quite happy to let him try. I’m just enjoying my ‘me’ time sitting in my kitchen, looking out the window and watching the sun desperately trying to break through the mass of grey clouds that seem to be forever threatening these days. Of course, at times like this I end up thinking of food. What will I serve on New Years Eve? I have to admit that even for someone like me who loves food – I’m struggling to get excited about another over indulgent feast. I’m craving something spicy and couldn’t possibly eat another creamy, chocolaty dessert. Of course, I’ll probably feel different in a couple of days. 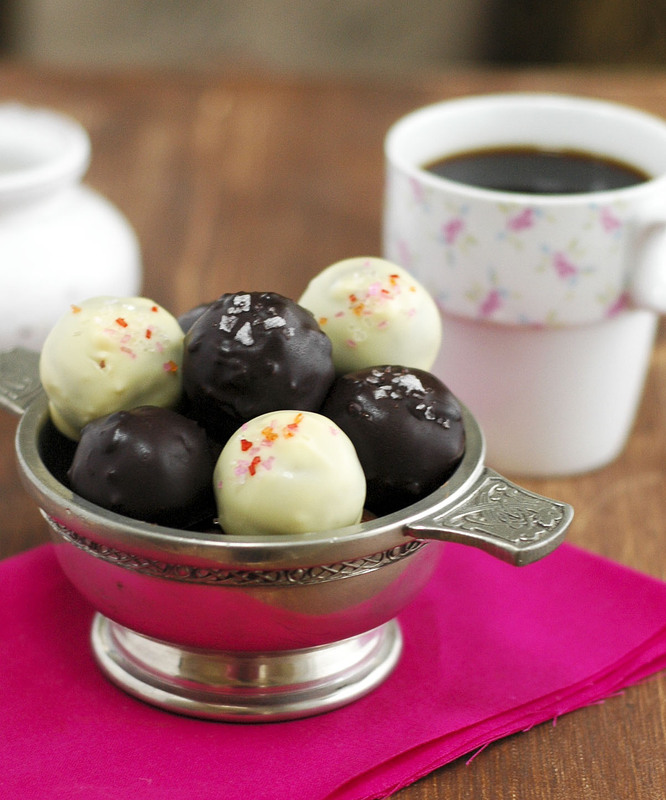 Instead of dessert I thought I would make these chocolate truffle balls to have with our coffee after the meal. They are not as rich as the authentic cream and chocolate truffles but are made with crushed biscuits instead. My Mum has been making these for years and I have changed her recipe slightly by leaving out the coconut and dipping them in melted chocolate. Most of the flavor will come from the chocolate you choose to dip them in. My favourite has to be the dark chocolate with Sea Salt Flakes on the top. Add the condensed milk and butter to a saucepan and heat gently on the stovetop until the butter has melted. In a bowl, mix the crushed biscuit crumbs together with the cocoa powder. Add the condensed milk to the biscuit crumbs and stir together until well combined. Put the mixture in the fridge for about 1 hour to cool down completely. Roll the mixture into balls (about the size of a walnut) and place on a baking tray which has been lined with baking paper. Return to the fridge to chill. Gently melt your chocolate in a heatproof bowl which has been place over a pan of simmering water. Using a kebab stick or something similar to hold your truffles, dip them in the melted chocolate and place back on the baking tray. This entry was posted in Sweet Treats on December 27, 2012 by Angela Darroch.